Crikey, aren't those photographs stunning? A few days ago I was helping my friend Sofia in planning her summer trip while we stumbled upon the picturesque Prague. I’ve been to the Czech Republic as a child but I do not recall it being this breathtaking. There is an amazing old town feel to it with a strong romantic undertone, isn’t there? P.S: Fun fact, did you know that the first sugar cubes ever were made in the Czech town of Dacice in 1841? P.P.S: A few more amazing spots in Europe: Paris, Bonn, Venice and Cinque Terre. How beautiful!!! Look how the daylight CHANGES everything! WOW! I want to go. oh my golly, my photos of prague are nowhere near this stunning!! gorgeous. Never been there. I've been to France - Brittany region. Very green and lots of countryside. I want to go there now! Hmmmm, I'll have to keep working on my instant travel device...kidding, but not really! Its high on my list, I definitely want to go someday soon! 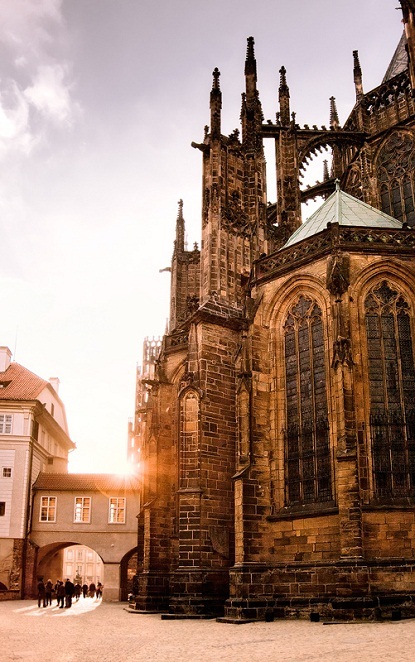 Prague has been on my must-see list for years now, I still haven't been :[ This photographs are freaking amazing. i haven't been there but I really want to go! Natasha, I SO want to go now and the bridge...swoon! I went and visited my cousin in Prague when I was 16. (That's where I got my nose pierced) It was such a magical place. I visited Prague some 8 years ago for my older brother's Hockey tournament that was taking place there... I have the most vivid memories of walking the Charles Bridge, entranced by skilled painters and artisans practically giving their work away (so cheap...) I'll never forget the experiences I had in the puppet shops, glass blowing factories and castle climbing... I can highly recommend as a lovely city to explore...pictures are beautiful! My parents have been and say its magical! tutusandtea, it all sounds so magical:) Thank you. oh those photos are so pretty, i'm ready for an adventure! I 've been there for a day on my way to London.It was trully magnificent! I'm going with my boyfriend at the end of November. can't wait... looks so pretty!